Is there anything worse than watching your little one struggle with a cold or flu? The stuffy nose, the constant coughing, the watery eyes, the burning fever, the cries of pain that continue throughout the night … it’s enough to make any mum’s heart ache. We’ve all been there. And we’ve probably all spent hours googling ways to help our kids when a cold or flu strikes them down. But before you reach for the blankets, the humidifier and the eucalyptus oil, find out the facts and myths behind some of the common cold and flu remedies. 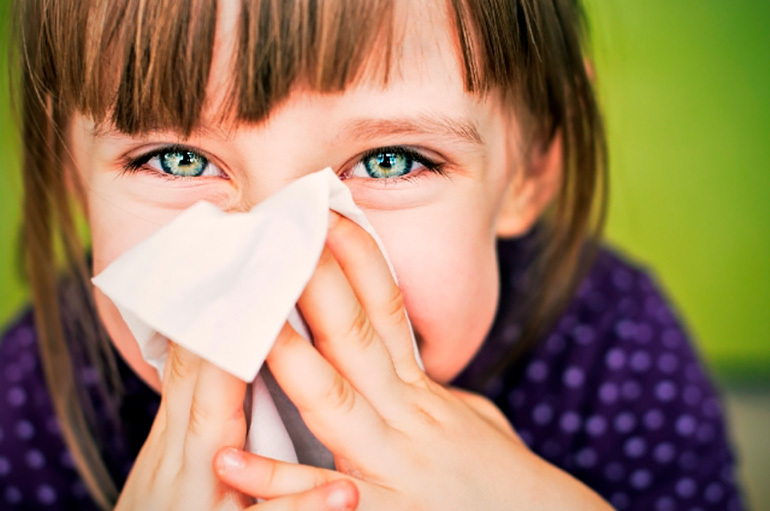 Children’s Cold and Flu Myths BUSTED! Yes, you can sweat it out at the gym after a bad day. But no amount of warm clothing or fuzzy blankets will help your little one sweat out a cold. Many kids love blankets when sick for the comfort level, but adding an extra layer won’t make those germs go away any quicker. It’s not uncommon for kids to lose their appetite when under the weather. But this doesn’t mean you should stop offering foods. Keep your little one hydrated with plenty of fluids. If your child is hungry, feed them. Soups, toast and crackers are three good options to try that are easy to digest. You may have heard that dairy makes your phlegm thicker. But this isn’t the case at all! Some kids actually ask for milk, cheese and yoghurt when they are sick as they are soothing to the throat. And little ones will often require extra breast feeds when sick. So don’t limit their dairy intake, even if they are stuffed up. Try a vaporizer to help ease congestion and excess phlegm instead. Sorry Grandma, but cold weather does not bring on a cold. Colds and flus come from viruses often in other humans and on surfaces, not in the cold air. While ‘Cool Mist’ humidifiers are useful for allergies and dry environments, they don’t do anything to help cold and flu symptoms. Only warm steam helps clear congestion, and only one product does this – a Warm Steam Vaporiser. Warm steam relaxes the throat muscles, loosens congestion, eases the cough reflex, soothes a sore throat and helps keep your little one sleeping comfortably. So what’s the difference between a Humidifier, Diffuser and Vaporizer? All of them release a substance into the air. Diffusers release an essential oil that can make your house smell pretty. Humidifiers release a cool mist that can help relieve allergies. But only vaporizers release a warm steam, specially designed to help clear congestion and alleviate symptoms associated with colds and flus. Learn more about the differences between the two as we delve deeper into the differences between humidifier vs vaporizer here. If you are on the hunt for a vaporizer, then a Vicks Steam Vaporizer is an excellent choice. You can pick yours up at Terry White Chemmart, Pharmacy4 Less and other pharmacies. When your child is sick, it’s often hard to know what to give them and how to make them better. This is another reason we love the Vicks Warm Steam Vaporizer. No ifs, ands, buts or myths attached. Watch on below as we share why we turn to a vaporizer every time when sickness hits our house! 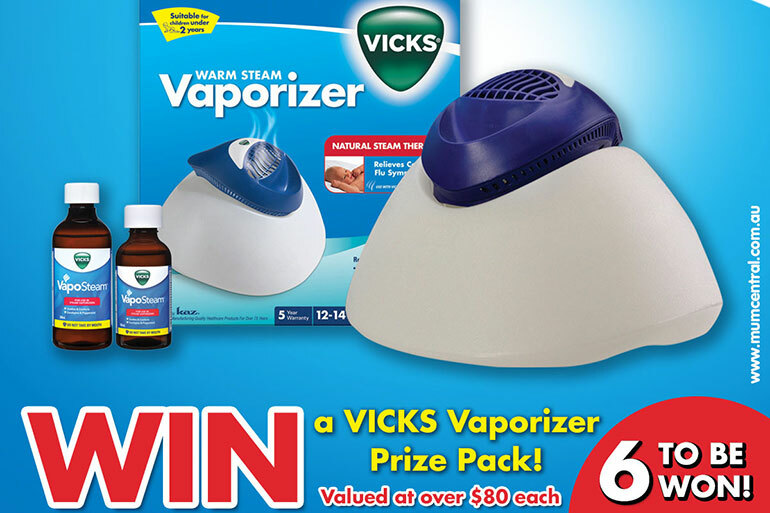 Here’s your chance to WIN a Vicks Warm Steam Vaporizer & VapoSteam Inhalant. 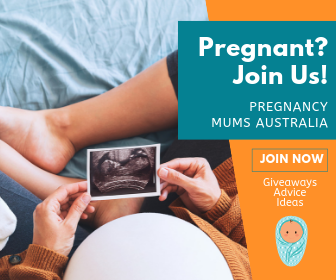 Valued at $89 each, we have 6 prize packs to give away to Mum Central readers. To enter, simply complete the entry form below in full to be in the running to win. My first bub is due in 2 months, so will get ALOT of use of it over the years to come. I love that it can run for 14 hours! I love that the Vicks warm steam vaporiser can be used overnight. It can last a full 14 hours, which is just amazing. I would love to win because I have a daughter who is constantly congested and has snoring issues. She is on the public hospital waiting list for a sleep study. Wow non medicated help for the whole family. Hubby suffers badly after a broken nose as a teenager every year with hay fever and the cold and flu season. OMG the noise my man makes in the morning trying to breath is enough to bring a wild animal on heat! He is constantly blowing and even gives himself headaches. Save him and my sanity and help him to breath easily all year round. !4 hours a day/ night, yes that will cover his sleep ins too ha. and stop him complaining EVERY morning about the lack of sleep. VICKS please Stop the man flu! at our place. I love that the Vick’s vaporiser is a gentle non medicated relief for colds and flus and congestion for the whole family. The best feature for me, would be the automatic shut-off. When caring for sick little ones,, the last thing you need to worry about is the safety of your appliances. Great idea. Thank you. the automatic shut-off; I stress about leaving things on, so that feature is perfect for me. I would love to win one for my SIL who is pregnant with her first bub; we already have this exact one and it’s been a god send, so I would love to win and pass it on. I love that it is gentle, all natural & non- medicated way of getting rid of cold & flu symptoms for the whole family. I love EVERYTHING about this natural pain reliever and health remedy but let’s be honest – mum brain is alive and well here so the automatic shut off would be amazing! perfect for overnight as it can run for a full 14 hours . Can’t ask for any more when down with a cold and sniffles. My son gets so congested during the night and the fact that the Vicks VapoSteam Inhalant can run for 14 hours is a clear winner. My son will be less congested and will fall asleep more easily. as i suffer badly from sinus/hayfever in winter this does the trick with helping me clear congestion, and only one product does this – a Warm Steam Vaporiser. There are so many features I love about this amazing machine! The natural steam therapy to relieve congestion without oral medication is a great alternative and the automatic shut off means I’m I can be at peace with it running unsupervised. Every family member from baby to Grandpa will benefit from this warm steam vaporizer and I can’t wait to try it out! I love the tempered vapor feature (warmed) which greatly helps relieve cough and congestion symptoms and provides a natural, safe and effective therapy to help relieve symptoms by adding war moist vapor into the air. I like how it can run for 14 hours and also has features of automatic shut off, very flexible indeed. Having this will come very handy when one of us sick and I bet it will become my hubby’s favourite cause he’s very miserable when he’s sick lol. I love this can be used for the whole family and can run for upto 14 hrs. We have just had the flu run through our whole house hold and had the cool mist running… to find out that was the wrong thing and we needed warm mist to actually help us all is very helpful. I love that the Vaporizer runs for up to 14 hours straight because my kids can sleep up to 12 hours a night especially when sick. The cut off feature when the water runs low is great, it gives me peace of mind and will allow me to sleep without worrying. The 5 year warranty is amazing too! Ahhh this would be perfect for my household! I have a three year old petite boy who is underweight and constantly congested! I also have a six month old boy who seems to suffer from congestion also! We live in a rural community where red dust and wheat dust are rife! This makes life hell! If I were chosen his machine would definitely get a work out!!! I love that it is ALA NATURAL! Good for the family and the environment its a WIN WIN!!!! The ‘family friendly’ features such as 25% cooler steam and an automatic shut-off. As a single mum i can only afford an older rental house. I have s 9 week old and at the moment we are currently experiencing our first cold together. This prize would help us both so much to get through this sniffly period and provide my new born with some releif with steam therapy. I would love to win this! We live on a dirty road and with 2 huskies we have so much Dust going through our house. Both my husband and i suffer from allergies all through out the year, not jus change of seasons, so this will help with our allergies! I love the Vicks works in the background as a non-medicated way to relieve congestion in our family! Have always loved Vicks. Always use Vicks for colds and flu. Totally need a vaporizer for my son. Sniffles and snuffles make bottle feeding very tiring for very sick bubs. It’s hard to suckle and breathe so having a soothing calm room where breathing is easy makes a huge difference. Keeping fluids up to a sick baby made much easier. This would really help when my son is congested and allow him to have a comfortable sleep. Favourite thing about the vaporizer is the automatic cut off feature when the water runs out. Gives peace of mind that my baby is safe. I love the fact it can run for a full 14 hours! That means no getting up in the middle of the night to top it up. I also love the security of it coming with a 5 year warranty that’s a huge and offered peace of mind to me knowing that if something goes wrong it should be covered under the warranty. I love that it can be used for every member of the household not just the little ones, but is suitable for kids under 2. It has the trusted Vicks name, and it’s all natural. What more could you want. The best features are how safe it is to use. I love that the Vicks steam vaporizer is suitable for the whole family and gentle enough for a newborn. The fact that it can run for 14hours is excellent, it can continuously be on for the whole night whilst bub is sleeping and i can relax knowing that they are getting some relive throughout the night. I love how my kids sleep so much better during the night and wake up so less congested and yucky when theyre sick, would love a 2nd so we can stop sharing. 7 weeks and counting for my 17 month old toddlers cold. This comp made me eyes literally light up. I love that it can run all night but most of all it’s Vicks which I trust and use their balm for her at night on her feet and chest. Not adding any medicine to her system is a huge plus too. I didn’t know that cold mist is no good so thank you very much for your all informative article. Really enjoyed this and hope to win the Vick’s Warm Steam Vaporizer and help her beat her cold! I love that the Vicks Vaporizer can run overnight while the children sleep. They can receive an extra boost while their bodies are already at rest. I love that the Vicks Warm Steam Vaporiser helps in relieving congestion and above all else, rhe most important function. With a toddler who gets wheezy when he is sick, it would be great to treat the congestion before it becomes a problem. Wow, would love to Win this, Reduce the congestion in our house! I first purchased a vicks vaporizer in 2009 and sadly it died only a month ago. Most of May this year was spent in hospital with our 6 month old twins catching every flu virus going around. Doctors reccomended the warm steam to relieve broncholitis thats left. So I would so so love to be selected as a winner to replace my faithful vaporizer. Automatic shutoff is my favorite feature because baby brain has made me so forgetful! I love the fact that it has an automatic cut-off switch so that if you are running it through the night and it runs low on water, it switches off!! 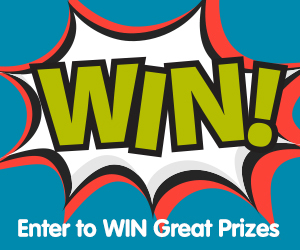 I would love to win the VICKS Vaporizer because it can be utilized by the the whole family! Would make a great pressie for first time parents, parents who have everything and just a great gift to give!! I love that it’s a natural way to ease congestion. Sounds great for my young sons who have repiratory issues and always catching colds! The 5 year warranty and the automatic shut off are both winners for me. I have been through 2 vaporisers in the last few years. Both have blown up weeks after after their 12 month warranty runs out! Both were gifted from my mother in law but neither were the Vick’s brand and it goes to show as now I don’t have any! My favourite feature is the automatic shut off – it means we can all sleep easy knowing there won’t be any danger if it runs out overnight! I love that it is compact enough to make it quick & easy to transfer between different rooms in the house and also the ability to have it running overnight knowing that it also has the automatic shut off when it reaches the 14 hours. Ideal for every member of the household, from your sniffling husband …this is what I love about it, plus the auto shutoff. I love the smell of Vicks in the air even without a cold and the fact you can run it all night 14 hours straight. I have a 12 week old who is very congested at night, particularly on the cooler evenings. I love that this has the automatic shut off feature so I can leave it running all night and not have to worry about shutting off myself. I have tried many different diffusers ( even expensive ones) but none of them really helped for cold and flu with my baby but just 1 day sleeping at my friends house that has the Vick vaporizer and my baby woke up better. I am really keen to have a Vick vaporizer now. I love that the Vaporizer runs for up to 14 hours straight. Perfect for my asthma and constant runny nose. I really like how it automatically shuts off when it is empty, and how it is a large night light as well. It gives me peace of mind knowing that my little ones are having a good night sleep and being decongested at the same time, nothing is worse than a blocked nose at bed time! I think the question should be what’s not to love! It seems to really meet every requirement, but to choose one thing I’d say that it runs for a full 14 hours, as ones I’ve had in the past don’t which is a real pain. Automatic shut off – my daughter has an underdeveloped right lung and the automatic shut off means I have the confidence to put her to sleep getting the benefits from the vaporizer and rest easy knowing we won’t have problems if I forget to check the water level before heading to bed myself. Vicks has been a staple go to in our house for many years. Having a little one in the family who seems to catch every cold and sniffle he comes into contact with the Vicks Vaporizer would be another weapon to help ease his congestion. I bought one of these and was awesome for kids when have colds and congestion, and coughs/croup, which can linger for months. Great to help get some sleep. For some reason after a bit everytime I would plug in would trip the circuit breaker and would not work. Would love another! These units are AMAZING for children with colds/flu’s AND croup!!! I have an old Vick’s vaporiser that I just couldn’t go without! My children love their vaporiser and ask for it at the first sign of a sniffle. The Vick’s products are a favourite in our household and an absolute necessity. We desperately need a new unit to combat the arguments over who gets to use the unit overnight please!!!! Love that I don’t have to worry about shutting it off, have left these things running for days on end before! I’m sure its the best steam therapy we’ve ever had! I love the fact that this product is gentle and non invasive and doesn’t have all the nasties that cold and flu medicine usually contains – Perfect for little babies! I have trusted Vicks since I was a child as a safe, soothing remedy for cold, flu and allergy symptoms. I like that it works for 14 hours! Awesome, plus I love that its a natural remedy first and foremost. I love that this vaporiser is specially for colds as a lot of ‘mist’ machines don’t actually help colds. I also like that the steam is warm so there’s no risk of burning curious little hands. I love that it’s non-medicated, all natural and can have it running for up to 14 hours. I’d love to win this because, no matter what I try my 2 children a constantly getting sick. Fabulous that the Vicks Steam Vaporizer can be run for 14 hours over night. Help everyone get a better night’s sleep. As a medical professional and mum, I want to give my family the best which is why I would love to win the Vicks Steam Vaporizer. Vicks is a leading brand and the safety features like the automatic shut-off, bacteria free steam plus the cooler steam to avoid scalding means that I have peace of mind that I can help my family through the cold and flu season without the risks of traditional vaporisers. The feature that I love the most is that is perfect for the whole family. This weather has been horrible for colds so love that it’s safe for everyone to use. I love that it can be used for the whole family. I also love the smell of Vick’s products! The best and most effective way to help with congestion naturally when our little ones are struggling to sleep. My favourite feature about the vaporiser is the automatic shut off. Euky bear doesnt offer this feature so if i dont win this I know for sure I will buying a vicks brand vaporiser. the best feature would be the automatic shut off system of the vicks vaporiser as you don’t need to worry about the water getting dry in the vaporiser which might create burns or fire even if the machine is left plugged on. I have 2 kids and winter is full of colds. I love the safety features for the family. Automatic shutoff and 25% cooler steam are very safe features for the children’s rooms. Bubs has had 2 colds in the last month. A vaporiser sounds like a good idea right now! I love how you can keep it running all night and don’t have to worry about turning it off. 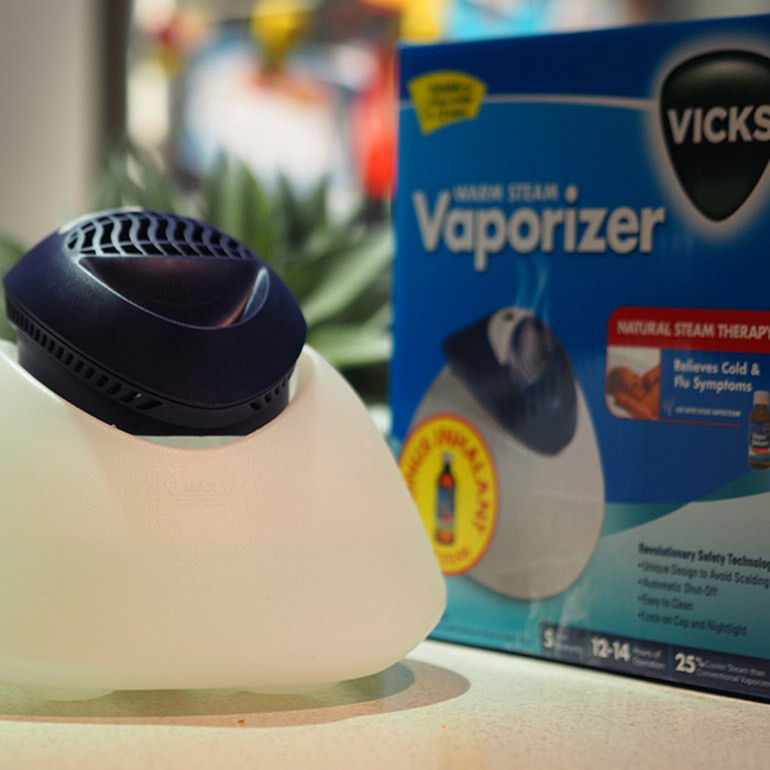 I love that the vicks steam vaporizer runs overnight – this is when cold symptoms feel the worst! I’d love to give this a try to keep the whole family healthy. Perfect for overnight as it can run for a full 14 hours. The automatic shutoff is the best for me !! The 5 year warranty is awesome, peace of mind that i am buying a quality product. No dousing up with medication required! Love to go the natural way when I can. Not just safe to use it smells nice too! This always helped when I was younger, now with my own son it is a life and sleep savour hun our household. I love that Vicks is such a trusted brand for my whole family. A fourteen hour capacity means that I won’t have to get up in the middle of the night anymore to check my kids rooms. This prize would mean so much to me living in Tasmania we are often subject to cold and flu season. The auto shut off is great; can leave it on all night without having to worry about it! I love that the vicks warm vaporizer is a trusted brand and name that i have always used. My newborn keeps on catching colds from her 2 year old brother. I love that the vicks vaporiser omits warm steam to clear congestion and helps with her nose breathing. My 9 month old daughter has been sick now for two months and this could really make a difference, as I’ve tried almost everything else with no results. I love that it is a natural way to treat cold and flu symptoms! It will be perfect for my 2.5 year old & 3 month old when they are unwell. Being able to feel better without being drugged up to the eyeballs sounds like a much better way to get through the Winter bugs! Also, being able to run it for the full night will give you a great nights sleep while you are healing. My little one is sick at the moment and finding it hard tl beathe. With such a congested bub I worry even more about sids (4months). This is such a healthy way to help her breathing for a good nights sleep and peace of mind. these are fantastic when you have asthma or a cold. They help with you breathing and have a blocked nose. I love that it releases a warm mist to relieve congestion, a major sleep disrupting issues in this sick household! I love the fact that the Vicks Steam Vaporizer offers a gentle, non-medicated, all-natural way to relieve cold and flu symptoms. This is edpeviallyni have as young toddler and I prefer to use natural method to relieve his cold symptoms when he is unwell. Other plus points are that i can leave it on for overnight and its automatic shutoff. I love that it’s a natural way to ease congestion for all members of the family, and the 14 hrs run time is a big bonus. My 10yr old daughter will be coming home from hospital soon and she recently had pneumonia so the vicks vaporizer would be perfect for her. My favourite feature is you can safely have it running overnight without having to worry about it and checking on it constantly. I love that it is perfect for the whole family and it can run overnight! The fact it lasts all night means we’ll get a good nights rest without feeling congested. Winner!! We all need as much rest as possible when kids are sick so knowing it runs up to 14 hours is fantastic and the 5 year warranty whoo hoo! I love the smell of vicks, it is instantly soothing. The fact that it goes for 14 hours is amazing!. We currently wait until our girls bedtime to put our old cool steam vaporizer on so it will last the night. This will cover from dusk till after dawn when it is needed the most. 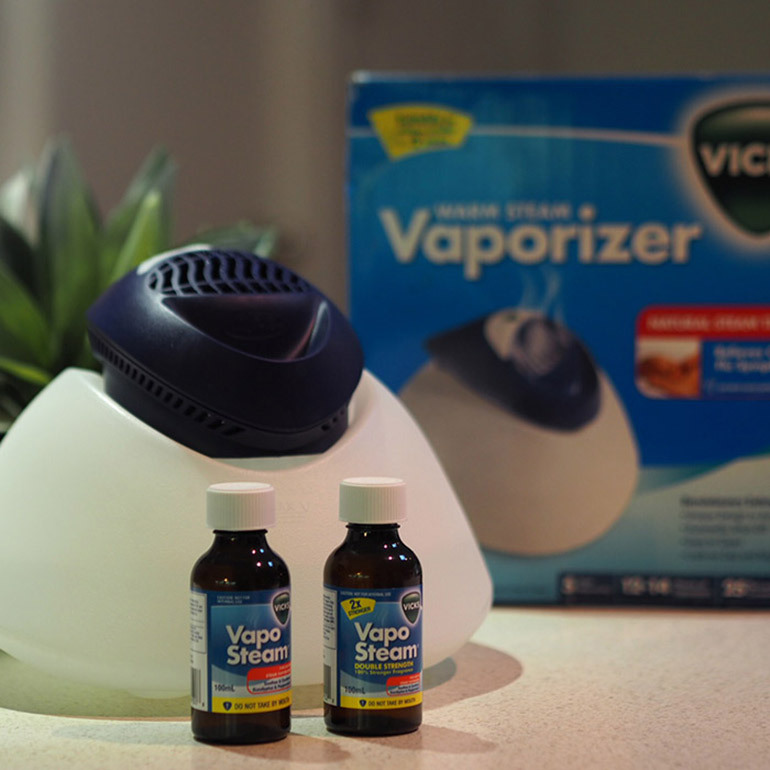 I love that the vicks steam vaporizer provides a natural steam therapy and can be used for the whole household for as long as 14 hours meaning we could all get a better night sleep! We would love this for my two munchkins. Our last humidifier died last month after 5 years in my sons room. They’re amazing and so good for the kids. It can run for a full 14 hours which means that hopefully we all get a good nights sleep because rest is the most important think for recovery when fighting a flu/cold. My favourite feature is that the Vick’s Vaporizer runs for a full 14 hours, perfect to see our sick little ones through the night and help ease the awful congestion of a nasty cold/flu. I love that it’s family friendly – that features like the cooler steam minimise the risk of my kids being burnt or otherwise hurt. To swallow the cure for their constant nose run! I love that the VICKS Vapouriser has the Automatic Shut off. It’s so comforting knowing my child can breathe and I can finally relax and ‘shut off’ too! Love how it is humidifier and relaxes calms my son down when he has had a terrible cough at night. I’ve been looking at a vapouriser for a while, with one child have chronic sinus issues this would be a wonderful help. I love that it has a long run time and that it has an automatic shut off and it’s natural! I love the smell it give i borrowed my friends and it made archers room smell amazing. I love how it helped clear his congested nose and helped him feel better quicker. I catch colds constantly and often pass it on to my son. We suffer terribly with the congestion. Being so stuffed up means we don’t sleep which makes us feel so much worse. I would love a Vicks vaporizer to clear our congestion. The fact that it runs all night will give my son and I the sleep we so desperately need. With two young grandsons at Day Care it’s a constant battle with colds etc and having to have time at home or with us (grandparents) and as much as I adore these gorgeous boys it’s hard to see them battle with these ailments. I love the fact that Vicks Warm Mist Vaporiser offers a gentle, non-medicated, all-natural way to relieve cold and flu symptoms. It’s nice to see a company care as much as us family members do. I’m borrowing a friend’s Vicks Vaporiser at the moment as my little boy has had croup along with a horrible cold and I love the quietness of it and the little night light. It does seem to have helped with his congestion too. It’s sound amazing with the automatic shutoff and great for the whole family being all natural would really help me with my sinus issues I have been battling for years . With so many other things to worry about when bubs (and Mum!) are sick & snuffly I love that with the Vicks Vaporizer I can set it and forget it……the long overnight running is taken care of and then it automatically shuts off. Perfect. I love the automatic shut off. Gives me peace of mind in case my frazzled head is busy fussing with everything else sick kids bring. My favourite features are the large water reservoir and the automatic shut off. It means that I can fill it once when my children go to bed and know that it will shut itself off which gives me peace of mind at night time. Vicks always makes such good products. This vaporiser sounds like just what we need to soothe my baby ‘s stuffy nose and my husband’s allergies. The warm steam feature and it’s also a night light! I would love to win this as I am a huge fan of all-natural treatments for my little one. Its a gentle natural way to treat cold and flu symptons and can run all through the night for up to 14 hours. I love that it’s a natural way of preventing and treating cold & flu symptoms. Instead os the copious chemical-laden meds Doctors prescribe. My Mum got Bronchiectasis from 10 years couped up in a small office with windows permanently shut, while 5 men smoked. Now, her immunity is so low that she catches anything and it takes nothing for it to turn into pneumonia . So I would love to win this for her. I love that the vaporizer can run for a full 14 hours overnight as my little one is a sleeper and she’s always snuffly. I have been using Vicks on my bub since she was a few months old, as she always gets stuffy overnight if she’s even a little bit chilly. Having warm mist in her room in a safe way would be a great way to keep her breathing easy overnight without me having to get up to reapply Vicks in the early hours. I love that it’s all natural and that it runs for 14 hours. Vicks is our first weapon against any signs of colds or flus for all of our family, it really works and has such a soothing scent. The automatic shut of feature is a great idea, great to help relieve cold and flu symptoms for a good nights rest. A vaporiser would be absolutely perfect for us right now. My almost 3 week old has been very congested the last couple of days. Before reading this post, I wasn’t aware that there was any difference between a vaporiser and a humidifier. This is great information. Also, running something like this, rather than medicating with Panadol or similar is better in my book. Thanks for posting! A must have is automatic shut-off for peace of mind and being able to treat my family with a gentle, non-medicated, all-natural way to relieve cold and flu symptoms = a full nights sleep for this anxious mum . A very good vaporiser that will help my kids breathe clearer when they are sleeping. The best feature about the Vicks Vaporizer is the Vicks name!! Vicks is a trusted name in most Australian households and for very good reason! We were recently gifted another brands’ vaporiser, however find that the 10 year old Vicks Vaporiser someone lent us is far better than our brand new one of another brand! I would love to win a brand new Vicks Vaporiser to help ease my 9 week old daughter’s congestion and breathe easier during the winter months. The automatic shut off is incredible also!! A very appealing feature. This would be perfect for my son’s congestion especially in the winter months. I love that it can run for a full 14 hours which means when my daughter gets a cold she can sleep with this on which will ease her breathing and hopefully get her a good night’s sleep as she struggles to drift off when she has a cold. I love that the warm mist actually helps a coughing child. There is not much you can do and when something works, then it is a lifesaver for the whole family. My daughter was born 3 months premature and her lungs struggle in winter. This will keep her and mum/dad at ease. That it can be run overnight, ensuring a good night sleep, breathing with ease. 25% cooler steam, so you don’t feel suffocated or smothered should it be ‘too warm’. Love to win because I’ve had my eye on one for a while, just haven’t gotten around to getting it yet. Favourite feature is, that it provides a gentle, non-medicated, all-natural way to relieve cold and flu symptoms. Love to win for this reason and more. I love that it will last 14 hours – no middle of the night wake ups for me to top up the water in our old humidifier. This would be perfect for my 4 year old son who gets croup multiple times a year. It is very distressing for him and this vaporizer would definitely be of a huge benefit to him. Always concerned about safety and leaving electrical things on overnight or while out so i love that it has an automatic cut off when the water gets to a certain level. No more worrying. It will always be our reliable, go to family plan! My kidlets could have really done with Vicks Warm Steam Vaporizer & VapoSteam Inhalant right about know as both are suffering colds, blocked noses and the rest. I suffer from asthma, bronchitis and a chronic lung condition that often leaves me with pneumonia. I struggle to breath at times and vaporizers really help me at night time . Our last vaporizer gave up the ghost this Winter and so i left without. Being on a disability pension with another chronic illness, money is scarce so we are all left with rubbing Vicks over our chests, tissues and pillows….. Would love to try the Vicks Warm Steam Vaporizer & VapoSteam Inhalant as i am sure it would benefit us all immensely . Automatic shut off is a godsend for the forgetful!